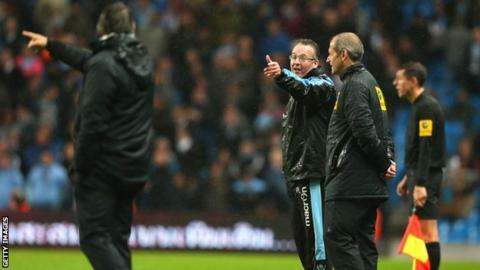 Manchester City boss Roberto Mancini says he is "very tired" with the behaviour of opposing managers after a row with Aston Villa's Paul Lambert. "I didn't say anything to him [Lambert]," he said. "There are some managers it is better to shut up." Sir Alex Ferguson - April 2012: Men are separated after an explosive finger-jabbing confrontation in the highly charged encounter which saw City take control of the title race. Mark Hughes - Feb 2011: An argument breaks out over an end-of-match handshake. David Moyes - March 2010: Mancini was given a suspended £20,000 fine after being found guilty of improper conduct for this row. He barges into the Scot and accuses him of time-wasting by holding the ball. Mancini clashed with Lambert during City's 4-2 Capital One Cup defeat. Lambert played down the incident: "It was nothing. If that's what he said then fine. I respect him as a manager and an ex-player." The City boss was upset by a tackle from Villa's Joe Bennett on City midfielder Gareth Barry, which led to his confrontation with Lambert. "I asked the fourth official if there was a yellow card, without moving my hands, and he comes over to me," Mancini said. "I can understand if I was talking to him but I didn't say anything. "I am very tired with their behaviour. Sometimes these managers go to the big stadiums and the other manager says everything and they say nothing. "When they go to [Old] Trafford, they say nothing. When other managers talk about the referee they always sit on the bench. I don't like this type of behaviour." The Italian has had previous run-ins with Manchester United counterpart Sir Alex Ferguson, who accused Mancini of "haranguing the officials" during a Manchester derby. City's boss has also been involved in arguments with Everton coach David Moyes and Mark Hughes when he was Fulham manager. City twice led through goals by Mario Balotelli and Aleksandar Kolarov against Villa, who equalised each time through a Barry own goal and Gabriel Agbonlahor strike. Charles N'Zogbia and Agbonlahor then scored in extra time to leave Premier League champions City without a win in four games. "We didn't play well and this is my fault because I am the manager," said Mancini. "Now I shall find the solution quickly as we have important games." Lambert played down the row and wanted instead to talk about his team's performance. "It is a massive result for us," he said. "I thought the way we played was excellent."